Today is October 4. On this date back in 1957, the world changed when the USSR launched Sputnik 1 into orbit. History was made again on October 4, 2004 when SpaceShipOne won the $10 million Ansari X PRIZE by being the first private spacecraft to reach suborbital space twice in the span of a week. 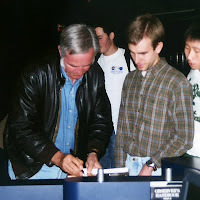 I was there in St. Louis in 2004 as Burt Rutan received the award, and it made an indelible impression upon me. 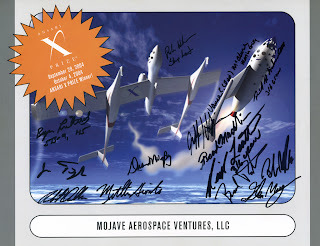 Below is a photo of me with Rutan as well as autographs I collected from him and other members of the Mojave Aerospace Ventures team who built the spacecraft. Many have lauded this achievement as the beginning of the personal spaceflight revolution. No one has done more for advancing this cause than Peter Diamandis, an inspiring entrepreneur who founded the X PRIZE Foundation and many other space organizations like SEDS, Space Generation, ISU, and Space Adventures. I first met Dr. Diamandis at an Explorers Club meeting in St. Louis, and he encouraged me to attend ISU, which helped launch me on my path towards space. Within the next few months the first companies will begin flights and within two years the first paying customers will be flying. Within three years the first commercial facilities will be overhead and within five years you will be able to fly commercially to orbit on a private spaceship. Mark your calendars! The Launch Pad reported that there will be a Q&A session with Peter Diamandis on the "Past, Present, and Future of the X PRIZE" this Tuesday, October 6 from 1:00pm - 1:30pm PST (20:00 - 20:30 UTC) on the X PRIZE Ustream channel. I won't be able to attend, but maybe you can.